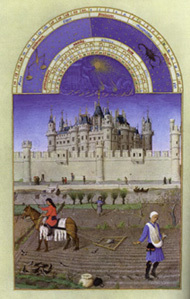 An important context to explore in Late Medieval and Early Renaissance art and patronage is the elaboration of palace design and the structure of courts. Here we can gain an understanding of the social, political, and economic worlds the artists and patrons operated in. 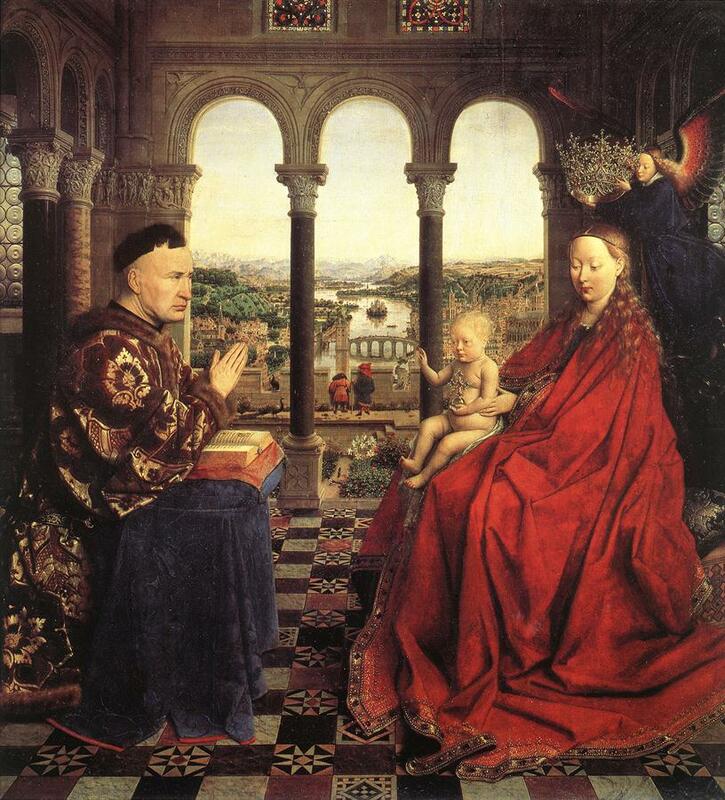 For example, a contemporary viewer of Jan Van Eyck's Rolin Madonna would have clearly understood the type of social space represented in the painting and the status of Nicholas Rolin as the Chancellor of the Duke of Burgundy. 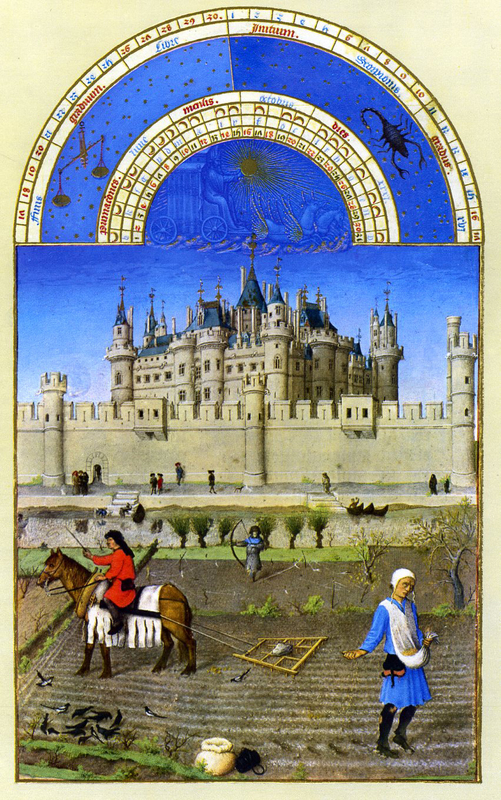 This page will examine palace design of the late fourteenth century as exemplified by the redesign by Charles V of the Louvre; the palace design of the Dukes of Burgundy; and the design of the palaces of Henry VIII of England. This sequence demonstrates the increasing elaboration of interior spaces with an increasing emphasis on the division between the monarch's public and private spaces. 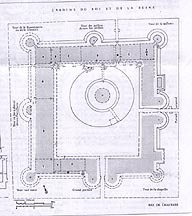 Concomitant with these developments in palace design there was an increasing complexity and greater hierarchical structure of the courts. Model of the 14th century Louvre with its foundations in the background. 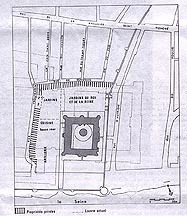 The major entrance to the Louvre was through the Grand Portail in the middle of the south range, while the principal spaces on the ground floor were located in the west range. 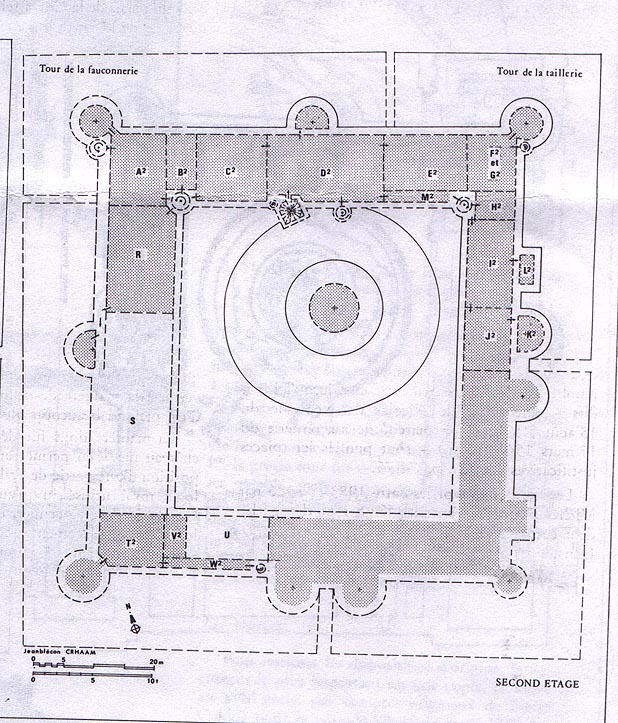 Here were located the grande salle and the grande chambre du roi. The grande chambre was used on special occasions when the proceedings of the great council were intended to be heard publicly. Adjacent to this room was the grande salle used by the King on the occasion of great feasts. 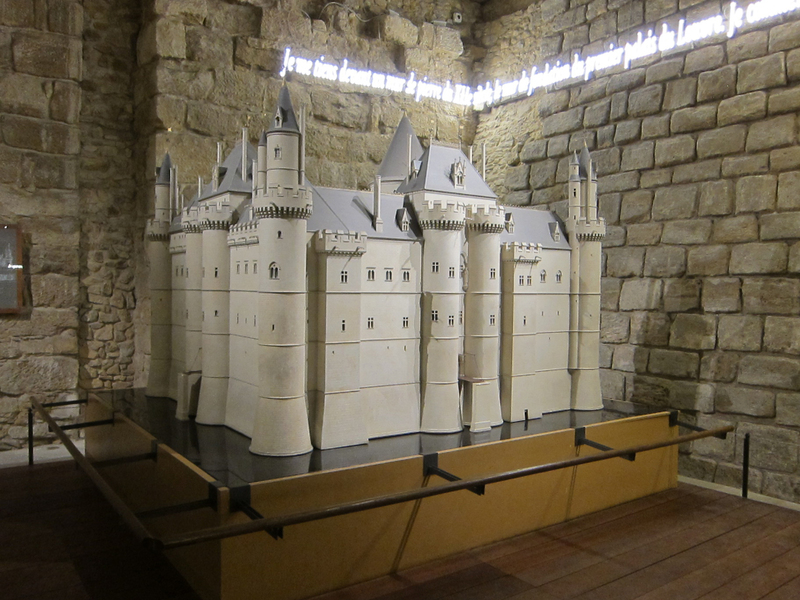 The grande salle was a little over 30 meters in length which was small for late medieval standards where the average grande salle measured between 40 and 50 meters. 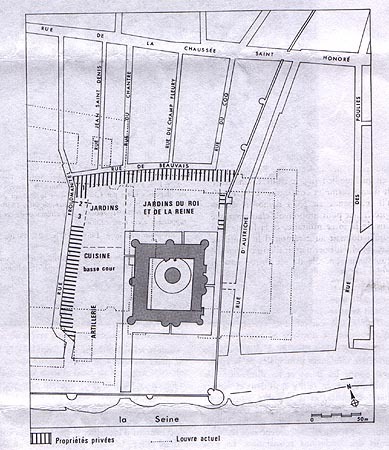 The grande salle of the old palace on the Île de la cité measured 73 meters in length. It would be there that major feasts and great ceremonies would be held such as the Imperial Visit of 1378. 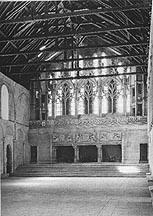 The great hall in Jean de Berry's palace of Poitiers gives us an idea of the nature of the space of the Louvre's grande salle. The dias elevated above the rest of the space by three steps was given extra focus by the addition of an imposing three hearth fireplace. 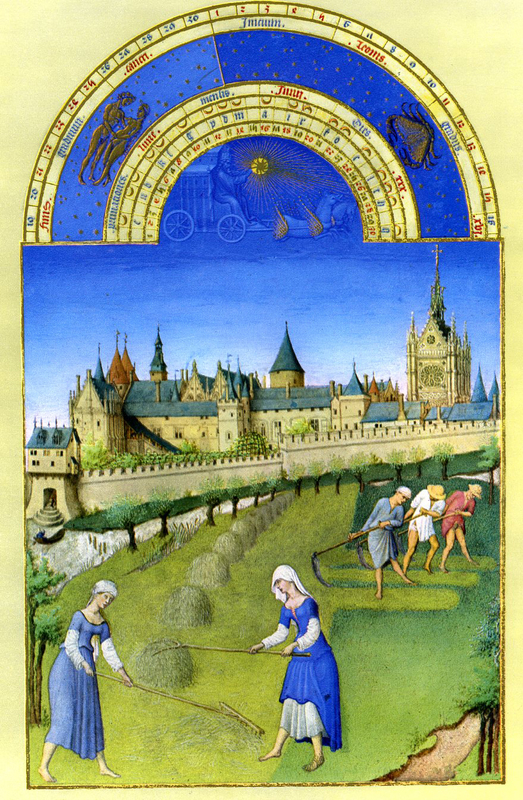 This arrangement is similar to that shown in the January page from the Très riches heures. Also located on the ground floor was the Royal Chapel. Wretched is the Hall...each day in the week /There the lord and lady liketh not to sit. / Now have the rich a rule to eat by themselves /In a privy parlour...for poor men's sake, /Or in a chamber with a chimney, and leave /the chief hall that was made for meals,/ for men to eat in. This shift from the Hall to the Chamber is reflected in the plans of the late Medieval and Renaissance palaces where the primary site of architectural innovation is in the spaces of the King's Chambers. Raymond du Temple's redesign of the Louvre reflects this trend. This is evident in the creation of a monumental stairway, the grande vis, that provided access to the more private spaces of the Louvre. The formality of this stairway was accentuated by being placed on the central axis of the palace directly opposite the Grand Portail. This plan effectively by-passes the grande salle, the old locus of power. The grande vis opened directly into the chambre à parer, and from there on through to the chambre de retrait and to the chambre du roi. 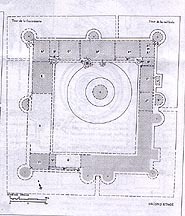 The sequence of three rooms (chambre à parer, chambre de retrait, and the chambre du roi) were the principal rooms intended for the daytime use of the king. Adjacent to the chambre du roi was the Tour de la fauconnerie in which was housed Charles V's library. The chambre à parer or the chambre de parement was the great state room. Accounts refer to a petite chapelle du roy and son oratoire. 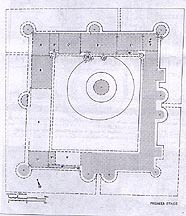 To the west of the chambre à parer were the rooms designed for the nightime use of the king. Pierre Salmon, Dialogues, Paris, Bibliothèque nationale, fr. 23279 fol. 53. 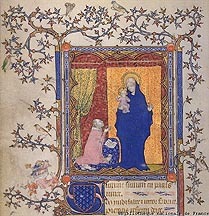 This miniature opens the Third Part of Salmon's text. After 1409. The miniaturist here clearly divides the palace into two spaces. We see at the bottom a guard who controls access to the palace. He greets two petitioners at the gate of the palace. This outer space is the domus providencie. At the top we see another usher holding a mace and standing in a doorway decorated with the French royal arms. This usher controls direct access to the inner sanctum, the space of the King. This is the domus magnificencie. 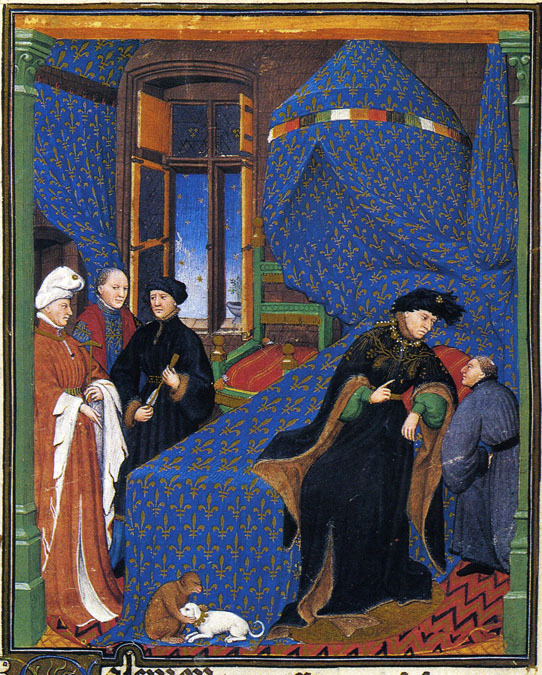 In the chamber at the top, Charles VI is enthroned and receives the text from Salmon while Jean de Berry and others look on. The room with the canopied throne can be identified as the chambre à parer or the chambre de parement, what the English called the Presence Chamber. It is here that King attended to affairs of state and received delegations and ambassadors. Pierre Salmon, Dialogues, Geneva ms. 165, fol. 4. 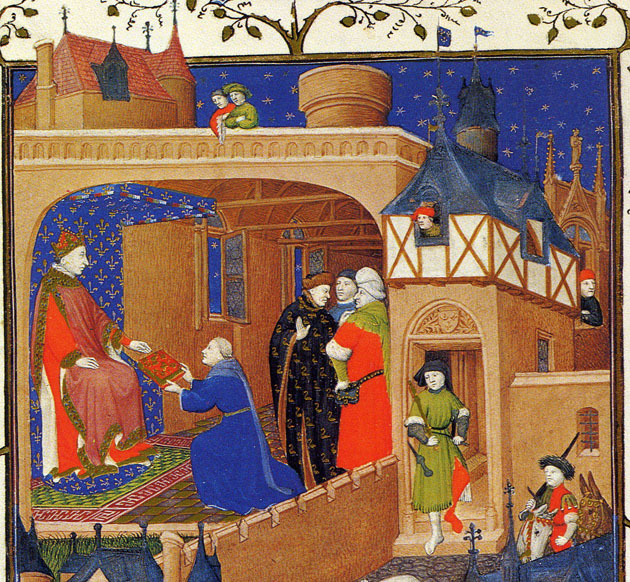 This miniature of Pierre Salmon in discussion with Charles VI shows John the Fearless, the Duke of Burgundy, holding a hammer, and a member of the Orléans family who holds a bolt from a crossbow. 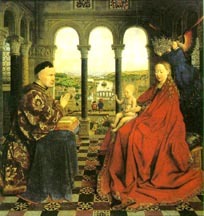 The third person standing between the two others is perhaps Jean de Berry. Access to the chambre du roy was more exclusive than to the chambre à parer. 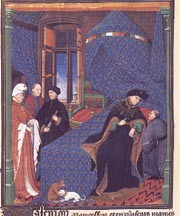 The inclusion of the princes of the blood in the Geneva miniature suggests this more exclusive nature of the chambre du roy. The greater privacy of this space is further suggested by the doorway partially concealed by a fleur-de-lis wall hanging on the left side of the miniature. This tapestry covering the door is like the curtains found in the presentation miniatures of Charles V where there is a comparable emphasis on privacy. I find a comparable order in the case of our own wise King Charles, so that it seems to me reasonable to recount his agreeable habit of leading a life well-regulated in all respects, which should be an example to all who may follow be it in empires, kingdoms, or important lordships for a well-ordered life. The hour of his rising in the morning was normally six or seven o'clock, and indeed anyone who wanted to make use here of the language of poets might say that just as the goddess Aurora, by her rising, rejoices the hearts of those who see her, so the king gives pleasure to his chamberlains and other servants appointed to attend his person [chambellans et autres serviteurs deputez pour son corps] at that hour, for, regardless of anything that might make it otherwise, his face was joyous. Then, after making the sign of the cross, and very devoutly addressing his first words to God in prayer, he exchanged with his servants, in agreeable familiarity, some pleasant and happy remarks, so that his kindness and gentleness would encourage even the least of them to joke and enjoy themselves with him, / p. 237 however humble they might be. They all enjoyed these comments and exchanges. When he had been combed, dressed, and outfitted according to the demands of the day's program, his chaplain, a distinguished person and honorable priest, brought him his breviary and helped him to say his hours, according to the canonical day of the calendar. Around eight o'clock he would go to mass, which was celebrated each day with glorious, melodious, solemn singing. In the retirement of his oratory low masses were sung for him. As he came out of the chapel, all sorts of people, rich or poor, ladies or maidens, widows or others who had problems, could make their petitions to him and he very kindly would pause to listen to their supplications, responding charitably to those that were reasonable or piteous. More doubtful cases he turned over to some master of requests to examine. After this, on appointed days, he would meet with his council, and then with some noblemen of his own blood or some clergymen who happened to be present. If some particular lengthy matter did not prevent him, he would go to the table around ten o'clock. His meal was not long, for he did not favor elaborate food, saying that such food bothered his stomach and disturbed his memory, He drank clear and simple wine, light in color, well cut, and not much quantity nor great variety. Like David, to rejoice his spirits, he listened willingly at the end of his meals to stringed instruments playing the sweetest possible music. When he had risen from table after his light meal, all sorts of strangers and others who had come with request could approach him. There one might find several kinds of foreign ambassadors, noblemen, and knights, of whom there was often such a crowd, both foreign and from his own realm, that one could scarcely turn around. Nevertheless, the very prudent king received them all and replied to them in such a civil manner and received each one so justly with the honor due him, that all considered themselves content and left his presence happily.... [H]e arranged what should be done according to what was proposed to him, or promised to solve some matter in council, forbade what was unreasonable, accorded favors, signed letters with his own hand, gave reasonable gifts, promised vacant offices, or answered reasonable requests. He occupied himself with such details as these for perhaps two hours, after which he withdrew and retired to rest for about an hour. After his rest period, he spent a time with his most intimate companions in pleasant diversions / p. 238, perhaps looking at his jewels or other treasures. He took this recreation so that excessive demands on him would not damage his health.... Then he went to vespers, after which, if it was summertime, he sometimes went into his gardens where, if he was in his Hotel of Saint Paul, sometimes the queen would join him with their children. There he spoke with the women of the court, asking news of their children. 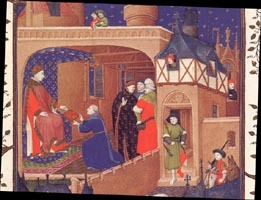 Sometimes he received curious gifts from various places, perhaps artillery or other armaments and a variety of other things, or merchants would come bringing velvet, cloth of gold, and all sorts of beautiful, exotic objects, or jewels, which he had them show to the connoisseurs of such things among members of his family. In winter, especially, he often occupied himself by having read to him fine stories from the Holy Scriptures, or the Deeds of the Romans, or Wise Sayings of the Philosophers and such matters until the hour of supper, where he took his place rather early for a light meal. After this, he spent a short period in recreation with his barons and knights before retiring to rest. 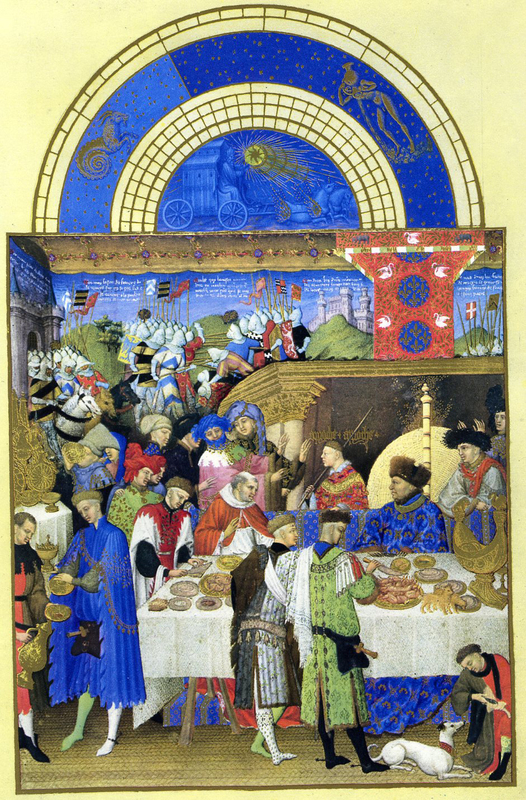 And thus in continual good order, this wise and well-bread king followed the course of his life [Excerpt from Christine de Pizan, The Book of the Deeds and Good Character of King Charles V the Wise, I.xvi, as quoted in The Writings of Christine de Pizan, ed. Charity Cannon Willard, pp. 236- 238]. The King then left the private world of his chambers to descend the grand vis to attend mass in the grande chapelle on the ground floor. Christine's reference to the "glorious, melodious, solemn singing" that accompanied the mass highlights the more public nature of this religious devotion. The king's public activities would continue with greeting petitioners in the courtyard. This accessibility of the King which follows an old French custom draws further attention to the public nature of the ground floor with its courtyard. The result was that in probably 1495 Henry VII divided the ceremonial and personal aspects of the Chamber. The most private of his new apartments, the Privy Chamber, was cut off from the rest; closed to all but a handful and given a small and humble staff of its own. 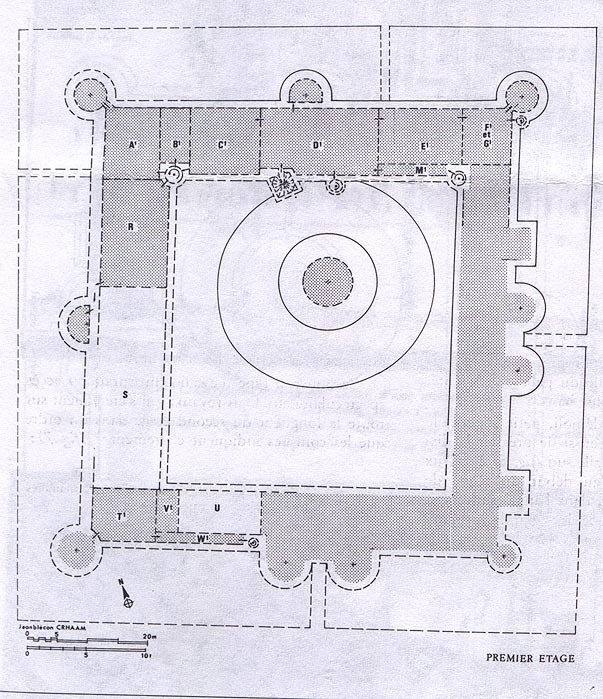 Henry VIII kept broadly to this outline, but transformed the Privy Chamber's personnel. He filled the apartment with high-born favourites and boon companions, and gave it an elaborate and largely French structure of office. These changes were more or less complete by 1518, and eight years later they were embodied into a new corpus of household regulations, the Eltham Ordinances. 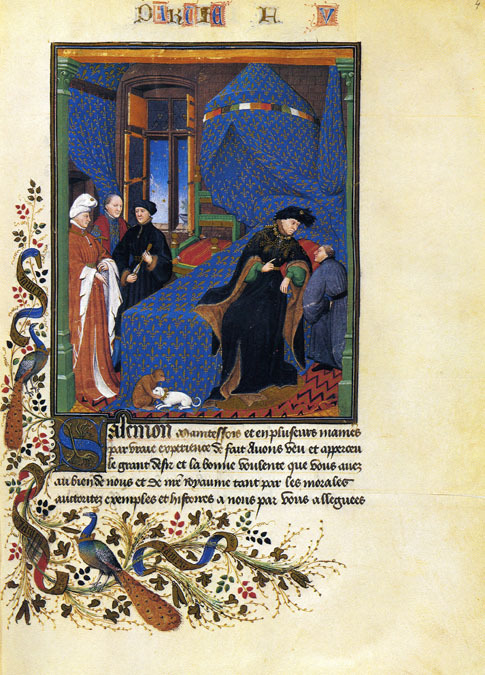 These contrast in every way with the last major set of household ordinances, the Black Book of Edward IV. Instead of being traditionalist and discursive they were bold and innovatory; and instead of dividing the household into two departments, the Household and Chamber, they divided it into three, Household, Chamber, and Privy Chamber. p. 5: But that contact, and with it 'the sight of the royal face', was the goal of the courtier and his raison d'être . This leads to a bold and crucial simplification. What mattered was not so much the right of coming within 'his grace's house. 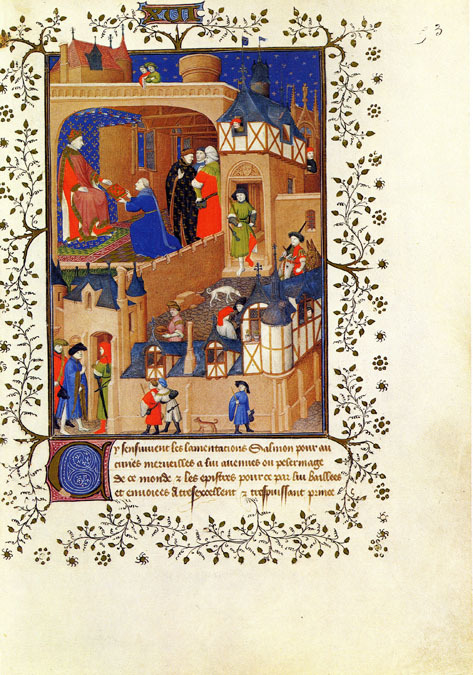 ; That general access to the court was the mere pons asinorum for the courtier. What mattered instead was the particular access to the Privy Chamber and beyond. p. 33 Keyed into this structure of the domus providencie for purposes of provisioning and domestic accounting and jurisdiction, but otherwise forming a distinct nexus, was the structurally and functionally very different complex over which the Chamberlain presided. In part this comprised specialist agencies each with its own organization: the Chapel under its Dean, the Signet Office under the king's Secretary, the Jewel House under the Treasurer of the Chamber and Keeper of the Jewels, the Wardrobes of Robes and Beds, the Office of Arms of the Heralds, the Minstrels (incorporated in 1469) and Trumpeters under their respective Marshalls, the medical corps headed by the king's Physician and Surgeon. But its central component was the personnel of Knights and Esquires of the Body, Carvers, Cupbearers and Sewers, Gentlemen and Yeomen Ushers, and Yeomen, Grooms and pages of the Chamber --a staff form whom demarcations of departmental 'offices' do not signify. these esquires of Household of old be accustomed winter and summer, in afternoons and in evenings, to draw to lords' chambers within court, there to keep honest company after their cunning (i.e. knowledge), in talking of chronicles of kings and of other policies, or in piping or harping, singing, other acts martial, to help occupy the court and accompany strangers. But equally, such Esquires were 'to be chosen of their possession, worship and wisdom, also to be of sundry shires, by whom it may be know[n] the disposition of the countries'; more particularly if they were Esquires of the body, their 'business is many secrets.' (Myers, Household, pp. 111 and 129)....Their role as a group was to realize kingly style in its various manifestations, and to embody the king's sense of his own role in the conduct of affairs. Accordingly, it is necessary to explore the ways in which these men of the court related to that wider context of political society, and thereby served as a means to political action.